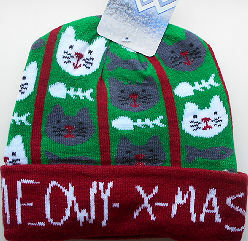 Here is a 100% acrylic hat decorated with cat faces. Around the edge are the words Meowy Xmas. As pictured, the hat is 8" high and 17 1/2" around, not stretched. The hat stretches open to 21" around. Cold water wash. New.